Evolutionary computation consists of a set of search methods based on the Darwinian principle of survival of the fittest.The methods include genetic algorithms, evolutionary strategies, and evolutionary and genetic programming. These methods have been successfully applied to many different problem domains including optimization, learning, control, and scheduling. This course will provide students with the background and knowledge to implement various evolutionary computation algorithms, discuss tradeoffs between different evolutionary algorithms and other search methods, and discuss issues related to the application and performance evaluation of evolutionary algorithms. To discuss and evaluate the field of evolutionary computation, including theory and application. Be able to explain and apply a simple genetic algorithm (sGA). Be able to explain and apply an advanced genetic algorithms. Be able to explain and apply evolutionary strategies. Be able to explain and apply evolutionary and genetic programming. Be able to explain the theoretical foundations for genetic algorithms. Be able to compare and contrast different evolutionary algorithms. Be able to conduct a literature review. Be able to critique others writing including journal articles, research proposals, journal article critiques, and conference papers. Be able to use online literature search tools. Be able to use a reference librarian as a resource for research. 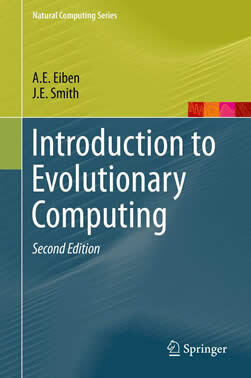 Introduction to Evolutionary Computation, 2nd edition by A. E. Eiben and J. E. Smith, Springer, 2015. Undergraduates should expect to spend, on average, from six (6) to nine (9) hours per week on preparation for this class. Graduate students should expect to spend an additional three hours per week. This time is in addition to the three (3) hours of lecture you are expected to attend every week. Homework assignments are due at the beginning of class. There will be six (6) homeworks, which will be collected and graded. The homework assignments will be scaled to 400 points. The homeworks will be combinations of questions from the book and programming problems. You must cite, using IEEE format, your references including online ones. Reading, problems, and programming exercises will be assigned on a regular basis. There will be one (1) project. This will be a larger effort using evolutionary algorithms to solve some reasonably complex problem. There will be five (5) article reviews. This will help you understand the relevant literature for your research project. You will identify articles that are relevant to the course topic, if you are unsure of its relevance double check with the instructor. For each article you will write a 1 page summary and a 1 page critique. Critiquing others work is an excellent mechanism for improving your own. It is backbone of the peer review process. You will be expected to evaluating others work including critiquing others article reviews, research proposals, conference papers, and conference presentations. There will be two exams for this course. One will be a midterm and the other a final.